Free-standing ultrathin nanomembranes are a new class of two-dimensional materials that possess nanoscale thickness across macroscopic dimensions. Such nanomembranes are not only ultra-lightweight but also robust and flexible. 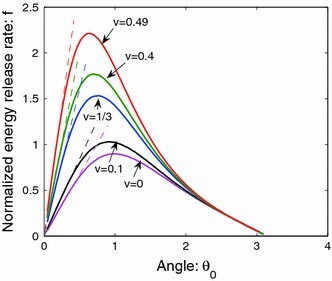 It has been reported that elastic moduli of ultrathin nanomembranes can be 1–10 GPa with ultimate strengths of up to 100 MPa [1–6]. These striking properties of free-standing nanomembranes have resulted in a broad spectrum of applications in separation, sensing, biomedicine and energy harvesting [7–10]. where f *is a numerical constant which depends only on the Poisson’s ratio of the membrane. 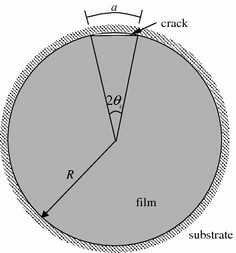 Equation (9) also implies that stiff membranes are easier to detach than soft membranes for the same W and This result is consistent with our preliminary experimental results. In these experiments, the stiffness of the membrane can be tuned by varying the length of the DNA molecules attached to the gold particles . However, more data is needed to confirm this result. Our experimental observations suggest that R c is in the range of 1–4 μm. The Young’s modulus E of a typical membrane is reported to be about 6.5 GPa . Assuming ν is 1/3, the pre-strain is estimated to be 0.12%. This estimate is based on the initial slope of the force–displacement curve of indentation tests , where we have assumed that the force–displacement curve is controlled by the pre-tension for small deflections and approximated the indenter as a point load. There is no direct measurement of W. Using the values of R c E and v listed above, W is estimated to be 15–50 mJ/m2, which is consistent with the strength of van der Waals interaction .